• On Wednesday, September 2 at 1:30 p.m, Jan Shupert-Arick, past president of the Lincoln Highway Association and past national director of the Indiana LHA, will talk about the famous road at the Center for History in South Bend, Indiana. She is author of the recently-published book, The Lincoln Highway Across Indiana, and also guest curator for the Center for History’s exhibit, Appeal to Patriots: The Lincoln Highway. A tour of the exhibit is part of the program. Admission is $3 and reservations are required by August 31. For information, call (574) 235-9664 or visit www.centerforhistory.org/. The popular Niland’s Cafe in Colo, Iowa, will reopen December 5 and operate three days a week through the winter. Bitters said hours of operation will be 6:30 a.m. to 9 p.m. Friday and Saturday and 7 a.m. to 3 p.m. Sundays. She said one of the things the restaurant will bring back from the past is the loose meat sandwiches that historic owner John Niland made popular for the restaurant. Above is Colo city clerk Scott Berka at the Niland’s Cafe counter. Scott Berka alerts us that the woman who was running Niland’s Cafe in Colo, Iowa, had some medical issues and closed the cafe after Labor Day. The Colo Development Group is hiring a manager to operate it, hoping to reopen shortly after Thanksgiving. Winter days will be Friday, Sat., Sunday, then likely back to daily except Monday come Spring. The motel is still for rent at $49.99 per night. Until the acafe reopens, those interested in renting a room should call the Colo Development Group office at (641) 377-2278. Once the cafe is open again, the number to call will revert to the cafe: (641) 377-3663. 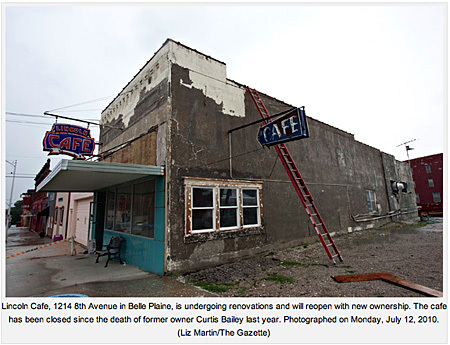 Classic cafe being razed in Grand Island, Nebr. A total of 18,400 vehicles travel daily on Second Street between Broadwell and Greenwich Street. To better accommodate that volume, the state will install a fifth lane a turning lane from Grant Street to Greenwich…. The right-of-way needed for the fifth lane simply brought the roadway too close to the Conoco Cafe, which the state acquired more than a year ago through condemnation. The last restaurant to operate there, Pam’s Cafe, closed Jan. 31, 2007, and relocated to South Locust Street. Last week, an environmental firm removed asbestos from the cafe. This week, a construction company is starting demolition. Road work will commence March 17 and wrap up in October, then next Spring, sidewalks, lighting, and landscaping will be completed. Iowa Lincoln Hwy Radio Tour Missed the Route! Above: Youngville Station, a beautiful restoration effort on the Lincoln Highway west of Cedar Rapids. When it’s open, visitors will find great pie and a historical display. The photos here show places NOT in the radio tour. Photo courtesy of G. Januska. All very interesting, but only #2 is along the Lincoln Highway. What did she miss? There’s lots more, from great old signs and garages to wonderful people in the diners and coffee shops along the way. What is your favorite? 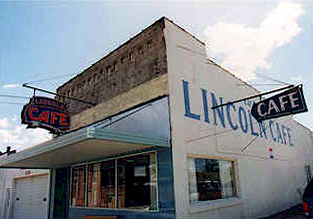 The one-stop, with adjacent gas station and motel, opened about 1920 at the corner of Lincoln Highway and US 65, the old Jefferson Highway. Historical displays line the walls, and a 1939 Cadillac bursts from a corner of the dining room. The car-themed menu has entrees like the Route 30 Pileup, a roast beef dinner, and fried bologna. Fridays feature all-you-can-eat fish with salad bar, fries, and cole slaw; Sundays are all-you-can-eat fried chicken. 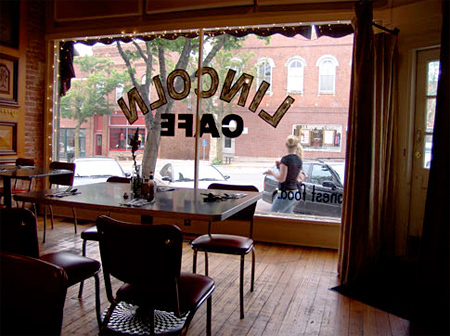 The town and café hosted one of my most fun book signings ever in 2005, when hundreds of locals turned out, most of whom had helped restore the café and gas station, loaned artifacts and photos, or donated to the effort. Here, Dan Halferty and Brad Snodgrass help me at the table, with Scott Berka in yellow directing the line. And Scott sent this picture of me signing a book for descendant John Niland with Jim Hartwig next in line. Tue–Thur: 6:30 a.m. – 8:00 p.m.
Fri–Sat: 6:30 a.m. – 9:00 p.m.
Sun: 7:00 a.m. – 3:00 p.m.